I first saw Lavanilla's Healthy Deodorant on another blog and read about how amazing it smells and how much better it is for you. The blogger made an interesting point. Girls spend so much time putting on good smelling lotion and perfumes, and then you end up putting on a stinky deodorant stick. Think about it. All the deodorants that we use are pretty gross. Even the ones meant for girls don't smell too great. It's all baby powder or heavy cologne. I knew I needed to try this, since I have a rollerball of Lavanilla's Vanilla Grapefuit and I get tons of compliments on it. Not many perfume companies come out with deodorant so this was a must have right away. The deodorants we use on a daily basis are full of all kinds of ingredients that are harmful, and possibly cause cancer. I learned this a long time ago, and I've tried several attempts at buying "all natural" deodorant. Something called Toms I think? Yes it smelled good and yes it was healthy but it didn't work. A couple hours after I applied it I had horrible body odor. So embarassing. So I switched back over to Dove, always thinking in the back of my mind there has to be something else. 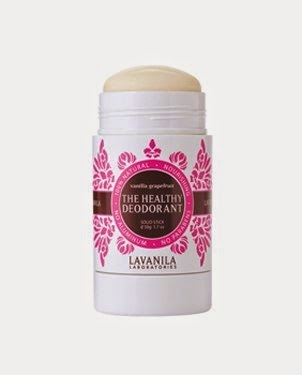 LaVanila's Healthy Deodorant comes in 6 different scents and claims to be "100 percent natural" It's made up of soothing essential oils that condition and nourish the sensitive skin under your arms. You won't get any stains or chunks of white which is another downfall of the store brand. It has no parabens which I guess is a big deal. I put it to the test and went to work and then the gym, with only one application of the Lavanila in Vanilla Grapefruit. It also comes in Pure Vanilla, Vanilla Summer, Pure Vanilla, Vanilla Lavendar and Vanilla Lemon. Next on my list is the Lemon because I'm lemon OBSESSED. As you can tell from the picture this has the look of a deodorant but to me it feels more like a perfume rollerball you are putting directly on your pits. The scent is only slightly there so no it won't make your armpits smell like heavy perfume, it just keeps you dry and scent free throughout the day. If you're a HEAVY sweater I'm not sure this will work for you, you might need something stronger. Maybe applying this twice a day would be suffiencent enough. But for me? I love it and I think it's worth a try, especially if you're worried about the harmful ingredients in drugstore deodorant. 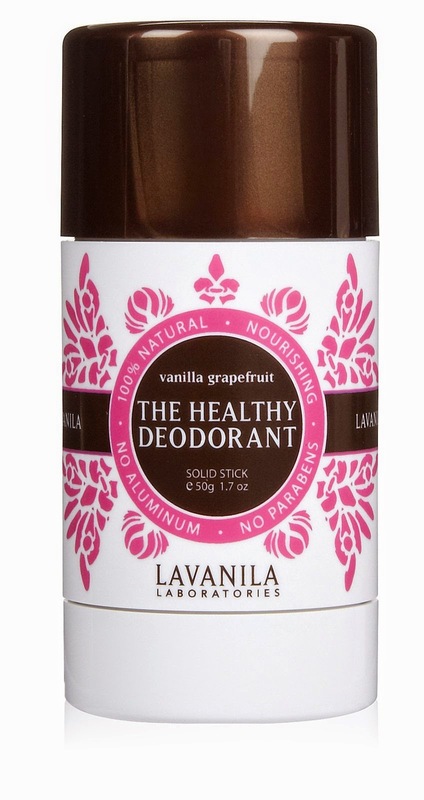 You can purchase Lavanila's Healthy Deodorant for $14 at Lavanila's site or a Sephora near you.